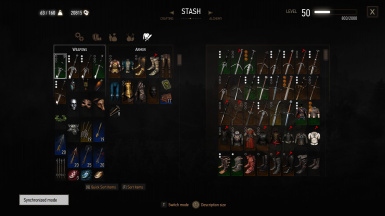 The mod makes stash management a little less painful: you can configure stash access the way you want and enable using of ingredients in stash for alchemy and crafting. You can also use Roach as a stash. - added an option to disable stash access through chests (still visible on the map and in game, but inaccessible). 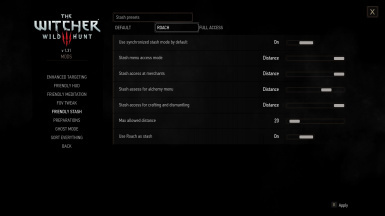 - fixed a problem with stash hotkey only working in menus and not working outside of menus. 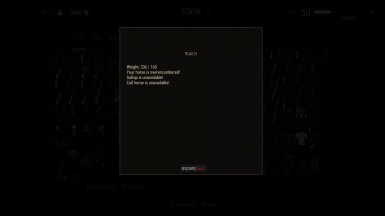 By default you can assess stash menu in view-only mode by pressing U or through Hub menu. 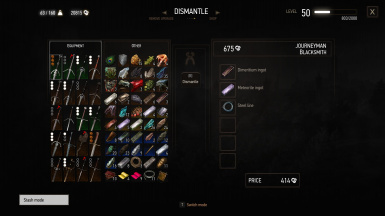 Stash items are also used for alchemy, crafting, can be dismantled and repaired while at alchemist or blacksmith/armorer. 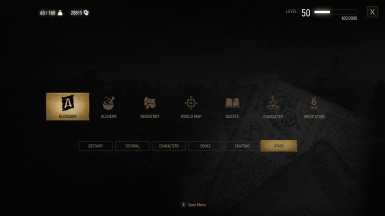 Configuration options are separate for menu assess, shop, alchemy and crafting/dismantling access: you can disable stash access altogether, allow full access or make it so it will only be accessible when in settlements or when you're close enough to stash (max distance is also configurable). Roach can be turned into a mobile stash with the mod: with separate carry weight limit depending on horse bags equipped and distance-based access. 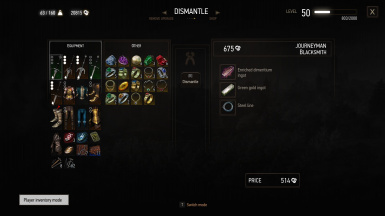 Configure the distance and press U to transfer items or access stashed items directly from shop, alchemy or crafting/dismantling menus when Roach is close enough. New synchronized mode is introduced for the stash: when enabled, it only displays stash items which belong to the currently opened player inventory tab; when disabled, it displays all items as vanilla. 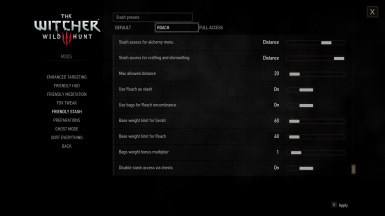 Base carry weight limit is configurable by the mod for both the player and the horse. Bags weight bonus can also be adjusted. It's recommended to use The Witcher 3 Mod Manager for automatic install/uninstall of the mod. If you prefer manual install, refer to manual install instructions from the readme. Friendly HUD by me. Merge with Script Merger.